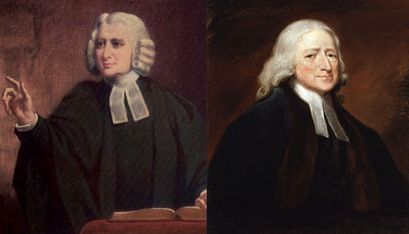 The Methodist movement was founded by the brothers John and Charles Wesley. The two boys were born in the rectory at Epsworth in Lincolnshire. John was born in 1703 and Charles in 1707. When he was six, John had an amazing escape from a fire at the rectory. Friends and relations believed that God had spared him for some great purpose. Later the two studied at Christchurch college Oxford where Charles founded the Holy Club, which was an austere society for Bible study and the provision of practical assistance for the poor and needy. The members studied according to the methods laid down by the college Statutes and were so disciplined and devout that fellow students gave the, the name "Methodists". In 1735 the two Wesley brothers embarked on a mission to preach to native Americans. On their outward passage, John, in particular, was impressed by the calm and fearless behaviour of a group of German Moravians who continued to sing hymns and offer prayers with apparent unconcern for a violent storm raging about them. The mission was not particularly successful and both brothers returned to the UK (Charles in 1737 and John the following year). They were both disillusioned and feeling that their faith was weak. This disillusionment was to change quite dramically in May 1738. Charles had been suffering from pleuresy and was recuperating at the home of some Moravian friends in London. He was deeply moved by the sincerity and strength of their faith and their concern for the welfare of others and he produced his first hymn "Where shall my wondering soul begin? "; the first of over 6000 he was to go on to write. He regained strength rapidly and began his ministry as a Church of England curate at St Mary's, Marylebone. A few days later, his brother John was persuaded, somewhat reluctantly, to go along to a Bible Society meeting in Aldersgate St in the City of London. As he listened to the speaker, he found his heart "strangely warmed". His faith in Christ revitalised, he began a lifetime of touring the country, moving from town to town on horseback or in horsedrawn carriage, preaching from homes, public halls or open air pulpits, urging compassion and practical support for the poor.